It’s Fat Tuesday, Time to Celebrate! In Italy, where there is always something to celebrate, Carnevale has arrived! Similar to Mardi Gras in many ways, Carnevale is celebrated in countries around the world. While Mardi Gras is perhaps better known in the United States, its origins can actually be traced back to medieval Europe. In fact, there is evidence of mardi gras traditions taking place in Rome and Venice in the 17th and 18th centuries. This is not surprising due to France’s strong influence in Italy under the rule of Napoleon. Today throughout Italy, the celebration of Carnevale begins 40 days before Easter. The celebration is centered around Martedi Grasso (literally translating to “Fat Tuesday”), a day of indulgence before the fasting of Lent. The origins of Carnevale are documented in several areas of Italy. In Ancient Rome, it can be traced back to the Roman Saturnalia festival that rang in the new year, while other historical records were found from 11th century Venice. The term "carnevale" derives from the Latin "carnem levare," meaning “take away the meat,” signifying the banquet held on the last day before the period of abstinence from eating meat (i.e. during Lent). During the Middle Ages and Renaissance periods, Carnevale celebrations were quite popular throughout Europe. In Rome, Carnevale gained popularity during the 17th century. Romans celebrated with a horserace on Via del Coros, when dozens of jockey-less horses stampeded down the main street. After multiple accidents, the activity was banned and more traditional celebrations commenced. Today Carnevale celebrations are held throughout Italy, with certain cities being more well known for their festivities. One of the most famous and revered Carnevale celebrations is held in Venice, where the city is filled with traditional costumes, masked balls, and a plethora of Carnevale related festivities. Venice has a long held tradition of Carnevale, which has continued to present day. 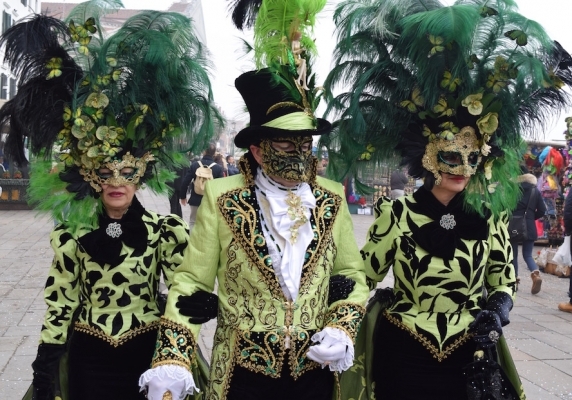 Carnevale was first celebrated in Venice in 1094 and was officially sanctioned by the Venetian government in 1296. Another well-known Carnevale is held in Viareggio, a city on the Ligurean Sea, in which parades are held each of the five weekends leading up to Lent. Here you will find elaborately decorated floats, street processions, paper mache masks, and traditional foods. In Ivrea, a small town in the Piemonte region, Carnevale has been observed since the 1600s. The celebratory period beings with a masked ball, followed by the “Battaglia delle Arance” in which locals hurl 400 tons of oranges. The throwing of oranges is a reenactment of a medieval tradition in which an uprising was staged against those in power by launching large quantities of fruit. During Carnevale, in fact, pranks and mischief are quite common, hence the saying “A Carnevale Ogni Scherzo Vale,” meaning during Carnevale, all jokes are valid. In many cities throughout Italy, you will find adolescents throwing confetti, streamers, fruit, or even raw eggs. While culinary traditions range from region to region, the food of Carnevale is always rich. This was (and still is) the time to indulge before the restrictive period of Lent. In southern Italy, traditional foods include lasagna, pork, and of course a plethora of desserts. One of the most traditional desserts of this period is “chiacchiere,” or fried strips of dough, served with “sanguinaccio,” a rich chocolate sauce. The name “sanguinaccio” derives from the traditional method of using fresh pig blood cooked with chocolate and spices (“sangue” means blood). In recent decades the sale of pig blood has been outlawed, yet the dessert is still enjoyed in a cruelty free version. As one may imagine, in the past Carnevale was a time for pig slaughter, and in the peasant tradition every part of the pig was used. Below you can find a recipe for the rich chocolate cream (blood free, of course), which can be enjoyed in any kitchen of the world! Serve with chiacchiere, strips of fried dough sprinkled with powdered sugar, or any cookie, biscuit or fruit of your choice! 1) In a deep bowl, mix the starch, cocoa and sugar. 2) Slowly add the milk, stirring to dissolve all the dry ingredients. 3) Transfer to a deep pan and place on stove over low heat. 4) Cook the mixture for about 20 minutes, constantly stirring. Don’t forget to keep stirring! 6) Transfer to a serving bowl and let cool. Serve with chiacchiere or your cookie of choice.